The basketball has kicked off and i have not made one post. It has been a great start to the season especially for all those with NBL.tv. Every game to watch on demand is awesome, since channel ten has dropped down to 2 games a week. The Perth Wildcats are looking unbeatable to start off the season having one their first two games by over 15 points. Round 1 saw the Wildcats face up against the New Zealand Breakers which was a big game for round 1 as it was a rematch of the NBL finals from last season. But the Wildcats trampled over the Breakers winning by 22 points. The Breakers are missing their inside outside threat Gary wilkinson this season and looks like they will feel the impact starting out the season. Round 2 saw them face off against the Finally full strength Townsville Crocodiles and pulled off a 16 point victory after a close first 3 quarters. The wildcats did not re-sign their 7 foot centre from last year Luke Neville but have remained a powerhouse team in the league. 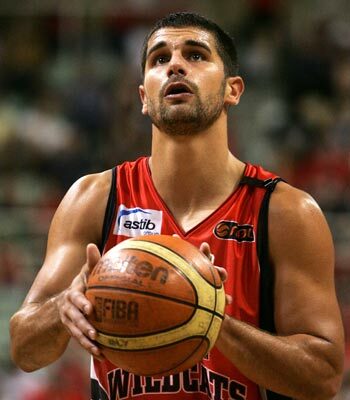 Since departing from the Perth wildcats Luke has signed on to the Indiana Pacers in the NBA. The Wildcats may feel that departure having a harder time on the rebounds. Will Hudson from the breakers had a big game against the Wildcats taking full advantage from Lukes absence. Through the season we will see if teams can get a handle on the Wildcats and take some advantage of the hieght advantage that some teams will have. The Adelaide 36ers were looking like a new team to take the championship at the start of the season having heavily recruited from the Gold Coast Blaze, signing Jason Cadee, Anthony Petrie and Olympian Adam gibson, they also picked up the big 7 foot tall Luke Schencher and look like a strong team. Round 1 saw them comfortable defeat the Melbourne tigers. Anthony Petrie and Chris Goulding were ejected from the game after a scuffle that saw both teams get mixed up in some pushing and shoving. After the game it sounded like that's what Petrie was signed on for, with Marty Clark happy with his passion. After this incident the 36ers blew away the tigers limiting them to just 5 points in the final quarter. Round 2 saw them face off against the New Zealand Breakers in the match up of the week. The Breakers however were to good and defeated the 36ers 73-59. Cedric jackson lead the breakers with 17 points, 7 rebounds, 7 assists, and 5 steals. He could be someone to put down for league MVP i was surprised he didnt get it last year. Woollongong are looking like a strong team having picked up some good import guards this year in Adris "2hard2guard" Deleon and Lance Hurdle. This is a massive improvement over their imports from last year and having gone 2 from 2 to start this season I think will be the dark horse of the competition. Melbourne and Sydney are looking to be in the fight for the wooden spoon this season as many people have not rated their teams. Both had losses in the first round and came up against each other in round 2. Sydney pulled off a come back victory lead by player of the week Corin Henry. Sydney's imports look to be a couple of very good new additions from Shane Heal in a smart pass first point guard in Corin Henry who can nail the jump shot and a strong forward in Darnell Lazare who has had over 20 points in his first 2 games. Sydney could come good later in the season if James Harvey starts hitting that jump shot of his to go with these scoring imports. Melbourne however still havent shown that can compete with the best in the league. But we will see next week when they face up against the Perth Wildcats how well they can compete agains the best at the moment. Townsville and Cairns both seem to be adjusting to their team and may get better over the season. Townsville only just had their imports for round 2 but look to be a couple of good players in Gary Ervin (NBL league MVP from 2010/11) and "the birdman" Larry Abney. Abney was renouned for his athleticism when he last played in the NBL and looks like he has added a nice jump shot to that arsenel. But we will see if he can keep up for the rest of the season. Cairns have retained Jamar Wilson the league MVP runner up from last year and I think they will come good after they get used to the NBL pace.